It was the moment wrestler Cody Minnick had trained years for, had sacrificed so much for. He was in the 2013 Illinois high school state finals in the 106-pound weight class in February, going up against Anthony Luis, a tough nut from Harvard. They had wrestled twice the year before, splitting their matches, but they had not met this season. The shorter, stouter Luis carried a record of 39-6, but Minnick, taller and as lean as a lightweight can be, had progressed and nearly reached the pinnacle. He was 47-0, and he felt this was his big chance, his day for reward. Then, just 19 seconds into the match, Luis grabbed Minnick and slammed him to the mat. The front of Minnick’s head hit first, then Luis’ chin hit him from behind. Minnick signaled to the ref that he was hurt, and he lay motionless for a long time on the mat as trainers and referees circled about him, giving him assistance. He had a cut on the back of his head, but to any close observer, that wasn’t the issue. He clearly had been knocked out, however briefly. Which way do you think (post title not giving it away) do you think the Cody Minnick case plays out? Before we go further, it should be explained that wrestling in Illinois, while being very good, has poor medical coverage. It has been my experience that the problems faced in football with head coaches wielding too much power is the same or greater in high school wrestling. This is especially the case when teams travel and being at the state championships is that type of situation. First of all, if the high school has an athletic trainer that is covering wrestling, that individual is NOT ALLOWED to be mat-side during any matches at the state finals. The athletic trainers there are contracted in by the IHSA, and hold the “medical coverage” for the tournament. For most teams and wrestlers these individuals are new to them, and have no history with the team or specific wrestler. This, IMO, puts the coach in a protective posture when dealing with injuries – its tough to trust those that you don’t know. However, it should not matter when it comes to athlete safety. And, yes, the match is resumed. A clearly concussed elite high school athlete is sent back into fierce competition. Even laypeople know now that a second concussion on top of a first can be devastating, even crippling. The news has been out for months, years. You can understand but not condone why a wrestler would want to continue. You can see the angle of why a coach would want his wrestler to continue, but at the same time that coach is ultimately responsible for the SAFETY of his wrestler. What I cannot understand is how an athletic trainer or doctor, who should have been near there, would allow this person to continue. In the video it is OBVIOUS, Minnick is not right. During this same postseason in question, I was ripped on and hounded by parents and coaches of a team in Central Illinois after I made the correct assessment of a concussion. That wrestler was disqualified from that day’s action and from the next days action as well, effectively ending that seniors post season and high school career. I didn’t want that to be the outcome but the decision was EASY as an athletic trainer. Minnick’s case is also an EASY case, and the very reason we continue to hammer home the need to be better educated and have proper medical care near by for such instances. IT DOES NOT MATTER IF ITS THE STATE CHAMPIONSHIP, if you have a concussion you must sit, and when in doubt sit them out. It’s part of sports and always will be. Coaches, parents and especially athletic trainers, please, I implore you to do the right thing! I’d like to defend fellow AT’s here, but I don’t really think you can. 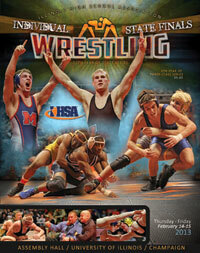 This is where the IHSA must step in and take action for the safety of the student-athletes. They have had a lot of lip service in regards to athlete safety over the last couple of years, but when it comes right to it the IHSA has done a poor job. I agree, and while I have many colleagues and friends who are athletic trainers in IL but all who at this event, from the AT to the MD to the coaches and officials this was a FAIL. There is no reason he should have been allowed to continue, championship or not someone needs to make the right call in order to protect the athlete from himself. This story is exceedlingly frustrating to say the very least. With the amount of publicity on concussions, how could this happen? My son’s concussion came during an away wrestling meet nearly three years ago. We were never told about the risk of concussions, what the symptoms were, and what to do if he felt any of those after a blow or jarring action to the head. The AT came out on the mat several times after every head blow (three in all). Each time he only asked how many fingers he was holding up and whether my son wanted to keep wrestling. He said yes because he did not want to let his team down and he had never been educated as to the risks. And no one else said no for him because the sport was more important than his safety even though our state high school league already had concussion protocols in place. His life has been radically changed and it is heartbreaking that there are more young people being put in this position. As I watched the Frontline episode last night, my heart broke for the NFL families who have paid so dearly for their player’s commitment to football. But when I see the lives of student athletes put at such great risk, it makes me angry. How many more CHILDREN (and yes, student athletes are children) will face life-changing and life- threatening injuries before we figure it out? I do not believe that this is an error on the IHSA – it’s plain ineptitude on whoever examined this athlete after the injury and allowed him to continue to participate. I do think having a HS athletic trainer present would be helpful. In my state, the state association athletic trainer and covering physician are allowed to overrule any other athletic trainer or doc present (but it is usually good rather than adverse collaboration that happens if the two need to interact on a kid).